We have been using the Companion Washing Machine for over 12 months and cannot fault it. 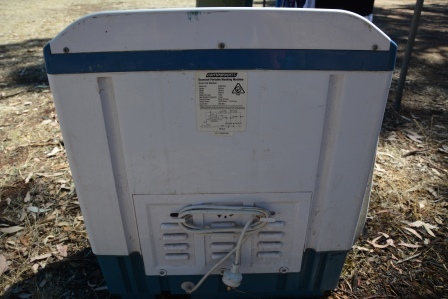 The washing machine has done over 500 loads of washing and is still going strong while we travel around Australia. It wont get the red Pilbara dust out of your favourite white tshirt but I dont think any washing machine will do that! 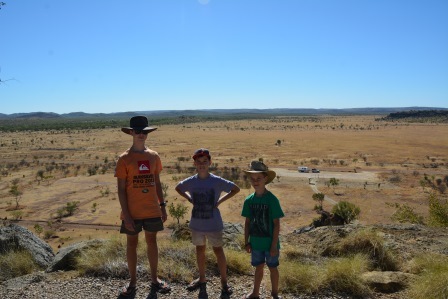 And why would you even wear a white tshirt in the Pilbara! Our Companion washing machine has a few wear marks on it after 12 months and even a burn hole from sitting a mozzie coil on it in Kakadu. It definitely looks worse for wear on the outside but everything still works ok. The pump still works fine even after using the harsh West Australian and South Australian water for 8 months. 1. Fill the washing machine tub up with fresh water from the tap or from the river using a bucket. Make sure the Companion Washing machine is level on the ground before filling it up so it doesn’t shake around. I use a smaller hose for filling the tub and run it from the caravan tap on the drawbar. 2. Add some laundry detergent. Some of the more experienced ladies that I met at the clothes line tell me that wool wash is good because you don’t need to rinse the clothes. I just use whatever the good wife buys on sale at the time. 3. Connect power to the washing machine and make sure the connecting plug is not on the ground in case water gets into it. 6. Pull the clothes out and put them in the spinner. If you are using an inverter, you can use either the spinner or the wash at the one time unless you have a $2000 inverter installed. Using both at the same time draws too much power for most middle of the range inverters. 7. Spin the clothes and put them in the washing basket. Dont hang them up yet because they need to be rinsed with fresh water. Apparently, not rinsing clothes can cause rashes where you don’t really want a rash. 9. Add fresh water and rinse all the clothes starting with the whites and undies. 11. Hang out the nice clean clothes. Give them a shake first to get out as many wrinkles first. 12. Dont forget to get the washing from the clothes line, fold them and put them away before happy hour. Its also important to finish off the full clothes washing duty, something that I often forgot about when happy hour would start a bit early. Michelle delegated the washing to me at the start of the trip and I can recommend to all the husbands out there to buy a portable washing machine and learn how to wash the clothes. 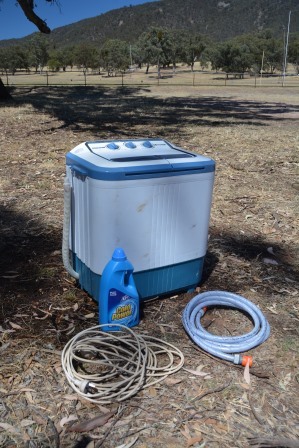 The Companion Washing machine has also saved us a heap of money instead of using the Caravan Park’s Washing Machines. We have seen up to $6 a load and some very ordinary looking machines as well that I wouldn’t be keen on putting my clothes in. The Companion Washing Machine is easy to use and we even run it through an inverter when we don’t have 240 volt power. It’s light enough to lift in and out of the Jayco Expanda and is stored towards the rear of the van. Quite often we leave it in the van when we are doing an overnight stay and don’t need to do any washing. The downfall of the washing machine machine is its size. It’s only a 2 kg load however I can still get a thick towel in there ok and spin it out. Its great for keeping up with the washing, especially with kids then we use the caravan park’s washing machines for doing the bedding. Ask the kids to get their own clothes from the pile and to put them away themselves. I cant tell whose clothes belong to who when you have two boys aged 8 and 11. And most importantly, make sure your wife’s clothes are hung nicely, not inside out and then folded correctly when dry! Took me a while to learn this tip and I still get it wrong sometimes.